USS Icefish (SS-367), a Balao-class submarine, was a ship of the United States Navy named for the icefish, any member of the family Salangidae, small smeltlike fishes of China and Japan. Also known as whitebait. Icefish (SS-367) was launched 20 February 1944 by Manitowoc Shipbuilding Co., Manitowoc, Wisc. ; sponsored by Mrs. Stanley P. Mosely, wife of Captain Mosely; and commissioned 10 June 1944, Commander Richard W. Peterson in command. After trials and diving tests in Lake Michigan, voyages down the Mississippi, and shakedown out of New Orleans, Icefish joined the Pacific Fleet at Pearl Harbor 22 August. Assigned to Vice Admiral Charles A. Lockwood's Task Force 17 (Supporting Submarines Pacific Fleet), she joined "Banister's Beagle's" (consisting of Comdr. Alan B. Banister in Sawfish (SS-276) and Drum (SS-228)) and departed 9 September on her first war patrol which took her into Luzon Straits and the South China Sea. October 1944 was a peak month in the war of U.S. submarines on Japanese shipping: 322,265 tons were sunk, and almost one-third of that total consisted of tankers. In October Icefish and Drum together sank 26,901 tons of enemy shipping in "Convoy College", code name for the area extending across the East China Sea from Luzon Strait to Formosa and the coast of China. Icefish sank a 4,000-ton cargo vessel on 23 October and on 26 October she was credited with sinking a transport of 10,000 tons. She terminated her first war patrol at Majuro, Marshall Islands, 13 November. Icefish departed Majuro 8 December on her second war patrol in company with Spot (SS-413) and Balao (SS-285). This patrol lasted 43 days with no results and she was forced to return to Pearl Harbor 20 January 1945 due to materiel difficulties. The third war patrol began 20 February when she departed Pearl Harbor with Sawfish and Kingfish (SS-234). This patrol was also conducted in the East China Sea, northeast and east of Formosa. As the war was coming to an end and Japanese shipping had dwindled away largely due to the "Silent Service", Icefish's third war patrol terminated after 60 days at Apra Harbor, Guam. Her fourth war patrol was conducted in the Hainan, Hong Kong, Formosa, Siam Gulf, and Java Sea areas. This patrol lasted 46 days with no contacts. Japan's sea arteries had withered away under the relentless attack of the U.S. Navy, and with it her dreams of empire and victory. Instead Icefish carried out another very useful function of our submarines. On 7 June with a PBY Catalina for air cover, she rescued six Army aviators off the coast of Formosa. Icefish arrived Fremantle 4 July for refit by Clytie and sailed 29 July for her fifth war patrol. En route to station 7 August a small diesel lugger of 15 tons was intercepted. The crew consisted of two Japanese, two Eurasians, and five Chinese. One Japanese jumped overboard rather than be captured; the rest were taken on board Icefish. The lugger was sunk by gunfire. Icefish arrived Tanapag Harbor, Saipan, 22 August 1945, thus ending her fifth and last war patrol. She departed Saipan 1 September arriving San Francisco 18 September. Icefish decommissioned at Mare Island 21 June 1946 and jointed the Reserve Fleet. Icefish received four battle stars for World War II service. Recommissioned at Mare Island 5 June 1952, Icefish transited the Canal Zone and arrived Groton, Conn., 14 July. She decommissioned there 29 July 1952 and received a GUPPY IB conversion. Recommissioned 10 December 1952 at Groton, she remained in that area conducting various tests until 21 February 1953 when she was decommissioned and transferred to the Netherlands. 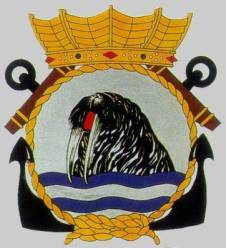 She was commissioned in the Royal Netherlands Navy as HNLMS Walrus (S802), the first of that name. Formally returned to US Navy custody, she was struck from the US Naval Register, 15 July 1971, and sold for scrapping, 15 August 1971.